Exhibiting at this year’s Agroprodmash 2018, chain maker Tsubaki aims to leave an impression at probably the most important industry event for Russian food manufacturers. Staged at the Expocentre Pavilions in Moscow between 8th and 12th October, Tsubaki will be based on Stand 82D90 in Pavilion 8, Hall 2, second level, where it will exhibit sample chains from its Neptune, Lambda and stainless steel ranges. It will also show specialist chains such as: vacuum wrapper chain, gripper chain, milk carton chain and PC chain. Tsubaki has a long history of serving the food processing industries and has developed a number of special chain products to meet its needs. For instance, Neptune chain is surface treated to make it highly resistant to corrosion, so is suitable for use in wet environments and where chemicals such as cleaning products are used, both characteristics of food applications. Another specialist chain, Lambda, is for use where external lubrication cannot be used for fear of contaminating food or the wider environment. Each Lambda bush is made by a sintering process and is impregnated with oil, which ensures free running over a long working life. Lambda chain is now available with food grade oil, so it is suitable for use in machinery used for processing, packaging or otherwise handling of foodstuffs. 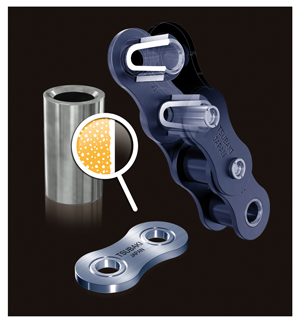 Tsubaki’s stainless steel roller chain has always been popular with food processors as it combines the corrosion resistance and extreme temperature operating range of stainless steel chain with the strength of a carbon steel chain. In many cases food industry engineers have been able to use a single strand of Tsubaki stainless chain to replace one of carbon steel, saving the need to modify machinery to accommodate multiple strands. Vacuum wrapping chambers are much used in the food industries but create harsh working environments, so Tsubaki has developed a specialist chain made from high-grade materials to provide long reliable life in extreme heat while resisting corrosion from sanitary washdowns. They are precision made to ensure smooth sprocket engagement for extended wear life, even at high speeds. Attachments can transform chain into application specific specialist equipment, and over the years Tsubaki has developed many innovative ideas for tasks within the food processing industry. For instance, it has created a dedicated milk carton transportation system and new side-swivel gripper attachments especially for the form, fill and vacuum seal applications used in many food packing applications. Tsubaki industry specialists will be available at the show to discuss the individual requirements of visitors and demonstrate how well specified, engineered chain solutions can help to reduce the Total Cost of Ownership.